In the retail-ready packaging (RRP) sector, corrugated board is still king, but plastics are starting to compete for the crown. RRP is used to improve the appearance of merchandise on the retail shelf through the use of self-contained display boxes or trays, and it’s a fast-growing niche sector within the industry. Figures from PIRA International show that demand for RRP will reach 27 million tonnes by 2016, up from a 19 million-tonne base in 2010. While plastics represent approximately 24% of market share compared to 75% for corrugated carton board, European packaging manufacturer Linpac said that plastics is starting to gain momentum in the RRP sector. 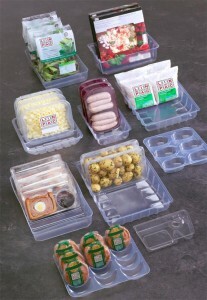 Due to an increased demand from retailers, Linpac has developed a new range of rigid plastic retail-ready packaging. A Linpac Packaging spokesperson told PlasticsToday plastics offer a better product protection especially in moist, chilled environments. “Linpac Packaging has supplied RRP to niche markets for a number of years now, but the increasing trend towards cost down initiatives at the retailer level and the fresh thinking strategy introduced by LINPAC at the end of 2011, has meant that we have taken another look at the range we offered and developed it further,” the spokesperson said. Applied to every aspect of the company’s packaging operations, the Linpac fresh thinking philosophy is about creating optimal ways to build a sustainable business that has a forward direction and ‘future focus,’ the company stated. Linpac’s plastic RRP takes on the more common board cartons that, according to the company, are more susceptible to damage during transportation, which put at risk the goods contained within. Linpac touts that rigid plastic RRP solutions have a greater level of flexibility, giving better impact absorption and an overall more structurally sound package. Benefits to retailers from using RRP include improved efficiency in terms of shelf space and the time taken to re-stock shelves, plus brand enhancement and shelf-appeal, the company stated. RRP increases sales, and creates less damage to food while it is in the warehouse and on the retail shelf. Linpac believes that RRP is the future of retail storage, display and transport. RRP from Linpac is predominantly bespoke to suit varying shapes and sizes. Manufactured from rPET, RRP from Linpac is recyclable and will contain a significant amount of post-consumer recycled material. The company is targeting food industries, especially products in moist, chilled environments.